1. Pre heat your oven to 180oc & grease your 2 cake tins with butter/spread & line with greeseproof paper ready for later. 2. Beat your eggs in the bowl first, add the sugar followed by the flour, baking powder & butter/spread. 3. Mix everything in the bowl until the ingredients are well combined. Using an electric whisk would make it easier but you could also use a wooden spoon & some elbow grease until the mixture reaches 'dropping' consistency. 4. Pour your mixture into the can tins as evenly as possible, use a spatula to remove any excess mixture in the bowl. 5. Bake your cakes for 25 minutes until they are golden on the surface. You can test the sponge by gently touching its surface & if it springs back they are ready to bring out & cool. 6. Whilst your cakes are cooling put your mascapone in to a bowl & sieve the icing sugar in with it. 7. Gently mix them together with a spatula being careful not to over work it. 8. Cut the tops off your strawberries & cut them in half length ways, if they are large cut them into quarters. 9. Once the sponges are cool remove them from the cake tin, you may need to use a knife to help them get out. Once out make sure you have both sides of the cake facing up that will be the center of the cake. 10. Find a pallet knife or just a flat knife a spread a layer of strawberry jam on the top-facing side of each sponge. After this spread a layer of the mascapone mix on top of the jam layer, you can be quite generous. 11. Decide which sponge will be your base & spread out the strawberries on to the mascapone layer on this one sponge saving a few for the topping. 12. Gently pick up your top sponge & place in on the base sponge so your cake is built. 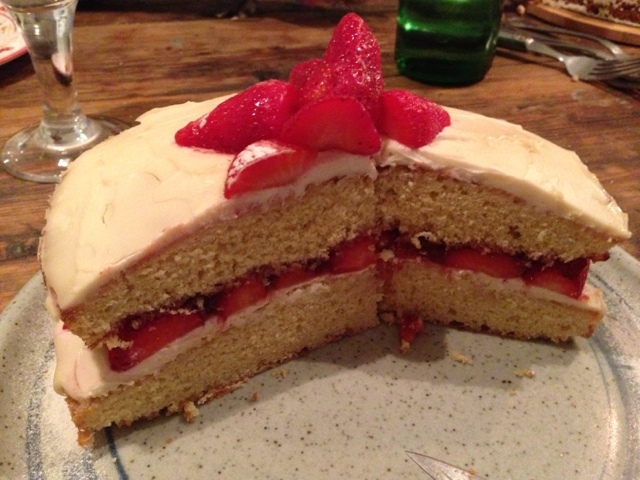 Spread any extra mascapone mix on top of the cake and add any extra strawberries to the middle. 13. 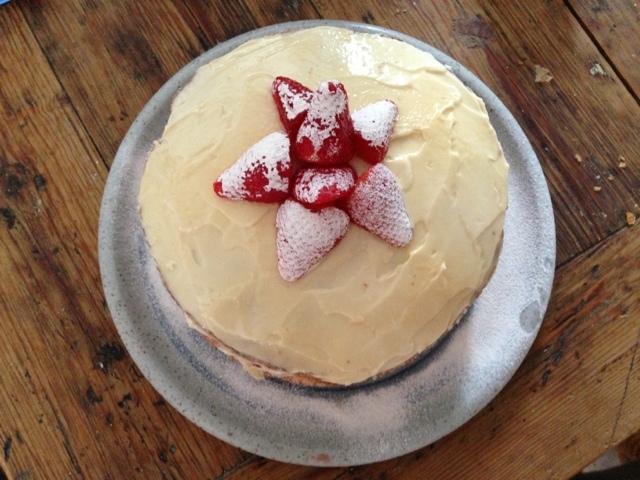 Finish off with a dusting of icing sugar. 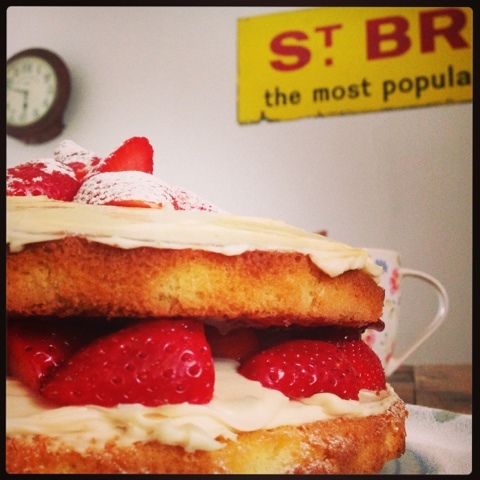 A classic British summer cake.